On a rainy and cold Cape Town weekend, AICA joined forces with CLASA, OSRBG and SACATS to stage 5 shows in a large marquee, as part of the Durbanville Petz Expo. The weather did not dampen the enthusiasm and most of the exhibits were entered on both days. What a lovely event with dog shows and lots of other animal associations and charities being represented. The AICA show was on 31 May 2014. Royal Canin did an excellent job as sponsor of the event and we were privileged to have two visiting Allbreed judges from Gauteng, Brenda Neukircher and Daniel Germishuys. The first of the shows on Saturday was the AICA show and again each judge could award one "Judges Best" only. 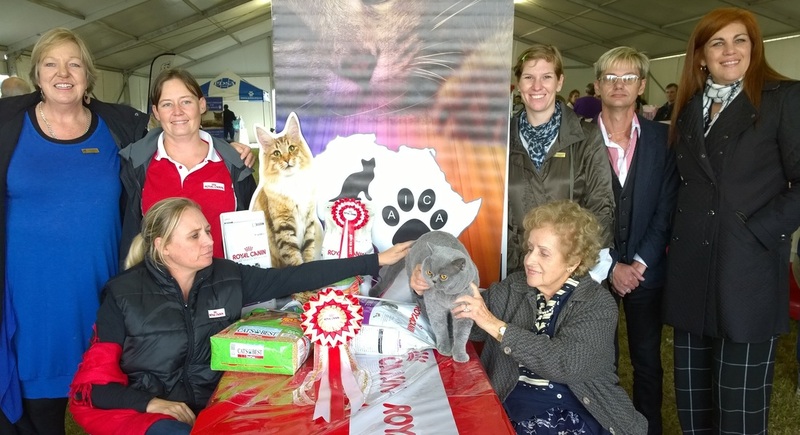 The winner was a lovely British Shorthair Blue, owned by Philippa van Diggelen, who sadly moved back to Gauteng a few days after the show. Thank you to all the exhibitors, judges, stewards and especially those who worked tirelessly behind the scenes to make this event as successful as always. Thanks to Petz Expo for accommodating us and once again to Royal Canin for making the event possible, by being a most generous sponsor.